With more than 300 million Indians already on the Web and another 200 million set to get online by 2017, the country is a major area of focus for Google — so much so that new CEO Sundar Pichai centered his Google for India keynote around the company’s programs to help bring the Web to the next billion people in India. Speaking in New Delhi during his first visit to the country as CEO today, Pichai explained that India has proven to be an excellent test bed for numerous technologies aimed at emerging markets. It may sound like we’re doing a lot, but in my opinion, we’re just barely getting started. We’ve realized that when we build products for India, they eventually make their way to a global scale. Given that India is on the cutting edge of the mobile revolution, we think that what we build in India will apply to many, many places. He cited examples like streamlined search, which serves up fast-loading results on mobile devices with slow connections; YouTube Offline, which lets you download videos to enjoy when you’re not connected; and Map Maker, which was built by two employees in Bangalore and lets people mark roads, landmarks and disaster-stricken areas on Google Maps. Pichai said he is excited about Google’s initiatives to expand connectivity across the country. When Indian Prime Minister Narendra Modi visited Google’s California headquarters in September, Pichai announced that the company planned to bring Wi-Fi to 400 railway stations in India. Today, he said that Mumbai Central station will be online in early January 2016, with 99 more to follow through the year. In addition, the company’s Project Loon, which aims to beam internet access to users from balloons in the sky, is coming to India. Google says it is working to integrate its service into major telecom operators’ infrastructure and hopes it won’t interfere with existing cellular systems. Pichai also said that Google is expanding its Helping Women Get Online program to to ensure they can take advantage of the opportunities that the Web makes available. After a pilot last year, the company is ready to roll out a larger initiative, offering demos on using a smartphone in 300,000 villages over the next three years. That’s all with the help of bicycles that carry devices and training materials. He also underlined the importance of delivering a quality Web experience for users who are getting online for the first time, which is highly likely to be using a smartphone in a language other than English. He noted that in 2016, there will more Android users in India than in the US. To that end, he reminded the audience of programs like Android One that aimed to bring the latest version of the company’s mobile OS to low-cost handsets; the company’s Indic Keyboard for Android that supports 11 languages and native scripts; and the introduction of offline support to YouTube, Translate and Maps for users on spotty connections. 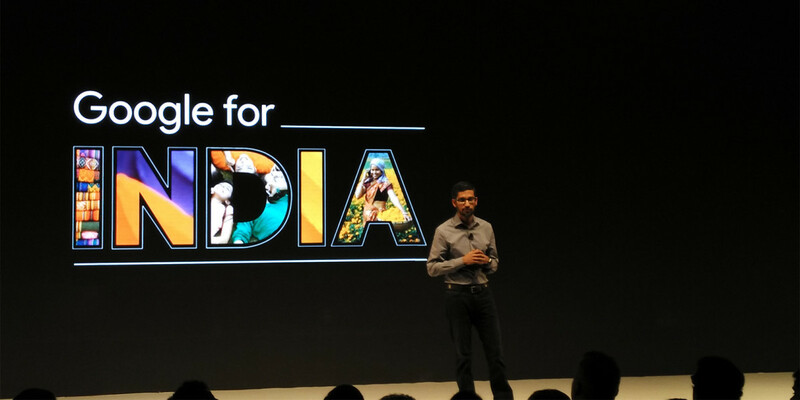 Lastly, Pichai is betting big on India’s potential as a mobile software development hub. Earlier this month, Google announced an investment of $20,000 in credits for 1,000 Indian startups to use towards paying for its cloud services. Pichai also said that the company will roll out a program to train two million Android developers over the next three years, in partnership with more than 30 universities across the country as well as the National Skill Development Corporation. I just want to say, thank you. This country has given me and Google so much; I hope we can give much more in return to India in the months and years ahead.